Captains America: Will the True Super Soldier Please Stand Up? Believe it or not, Chris Evans was not the first guy to bring Joe Simon and Jack Kirby's super-patriot Captain America to the big screen. Nope, the blue-eyed, blond-haired Steve Rogers has been defending our country from varying degrees of villainy on TV and in movies for a while now, and seeing as the latest - "Captain America: The First Avenger" - has arrived on DVD and Blu-ray this week, we feel it's a good time to let you in on how Cap's been treated before. Be warned: it's not always pretty. Former USC football player Brown rose to semi-prominence during a period when pectoral muscles got you more gigs than Shakespeare monologues. After two Cap movies, he starred in such cult classic schlock as "The Sword and the Sorcerer" and "Yor, the Hunter From the Future" (which, despite its awesome theme song, is generally regarded as bad). The disturbingly Eric Roberts-looking Salinger, the son of famously reclusive author J.D. (seriously), was pretty much just known as one of the three main Alpha Beta fratboys who terrorize the geeks in "Revenge of the Nerds." Which one was he? The one who wasn't Ogre or Ted McGinley. Evans actually portrayed another Marvel Comics character - Johnny Storm/The Human Torch - in two blockbuster "Fantastic Four" films prior to taking up the mantle of the Star-Spangled Avenger. It was a huge step up for a guy who is usually really good in underrated movies ("Push," "The Losers," "Scott Pilgrim vs. the World") or the best thing in bad movies (um, see the aforementioned "Fantastic Four" films). Seeing as these films had a combined budget amassed almost entirely through tip jars and aluminum can recycling, there is nary a supervillain to be found. Instead, you get a power-mad industrialist with his own pet nuke, and a vaguely South American terrorist named Miguel (who actually refers to himself as "the famous terrorist Miguel"). But, hey, they got Christopher Lee! 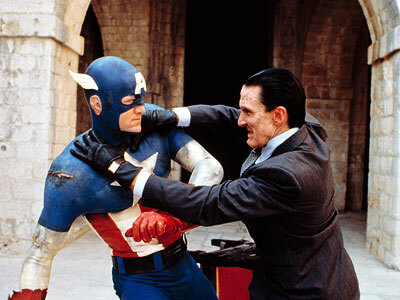 The Red Skull is a classic Captain America villain, but for some reason this film decided that the deformed ex-Nazi should be...Italian? Yes, we learn that Fascists murdered his family when he was a boy and forced him to be their lab rat. Which makes him more sympathetic, we guess? Either way, he spends most of the movie looking like Robert Davi. Now this is a proper Red Skull. Hugo Weaving, with his Werner Herzog-inspired accent, is a classic, fist-shaking, hiss-worthy uber-Nazi thug. He's not a poor orphan, he's the kind of guy who thinks Hitler is too much of a "people person." Who better to get taken down by a super-powered Boy Scout? Brown's Steve Rogers lives in the beige wonderland that is late 70s california, but we learn his father was a government agent in the 40s (his nickname? Take a wild guess). They make the already six-foot, muscular Brown a sensitive artist (who actually sketches his first Cap costume) and an ex-Marine who takes a serum that doesn't actually seem to change him much. The 1990 effort attempts to stick closer to the source material, since it opens in the 30s, shows Cap getting stuck in ice in the 40s, and then the rest of the movie deals with defrosted Steve (who is also made a Californian) in the modern world. Instead of trying to pass off the pre-super serum Salinger as a runt, they give him polio. Ripped straight from the comic pages, we get Rogers as a scrawny, scrappy "kid from Brooklyn" who will do anything to join the war effort. His transformation from wedgie-recipient to super soldier is impressively conveyed through the clever use of CGI and stand-ins. First of all, Cap should not wear a helmet usually designed for kids who are prone to seizures. To make matters worse, his iconic shield is not only see-through, it's made of "Jet-Age plastics." That's right, ladies and gentlemen, behold Captain America and his plastic shield! The makers of this movie did their best to translate Cap's costume directly from the comic book pages, proving once again that that almost always looks ridiculous. Salinger looks like he's wearing the "Deluxe" Captain America costume from Halloween Express. The newest Cap movie shows a nice progression from USO costume to pieced-together military fatigues, to slightly more colorful military fatigues. We're even told that Cap's shield is made from the fictional Marvel Comics metal "vibranium" as a nod to the faithful. Salinger's Cap spends a lot of time running around studio backlots and empty parking lots while stock footage of tanks is intercut around him. But at the end, he does rescue Ronny Cox from a castle-like house, tenuously connecting "Captain America" to the end of "Beverly Hills Cop." Director Joe Johnston gives us a sprawling, Real 3D adventure with lots of war-torn locales and a ton of satisfying shield-throwing. Fans are also treated to a montage of Cap and the Howlin' Commandos essentially winning WWII with an army of six. Well, let's see...has anyone else managed to release a Captain America movie and a sequel in the same year? We think not. In addition to Ronny Cox, we get a small role from Ned Beatty which also gives this "Captain America" an uncomfortable connection to "Deliverance." The creation of Marvel Studios allows this Steve Rogers to exist in a larger world of superheroes, so we know for a fact that we will eventually see the striped do-gooder join The Avengers alongside Iron Man and Thor. "Captain America: The First Avenger" is out on DVD, Blu-ray, and 3D Blu-ray now. "Captain America/Captain America II: Death Too Soon" and "Captain America" are available on DVD from Shout! Factory and MGM, respectively.